War. It's always on the news somewhere, isn't it? It's something that the human race can never be free from it seems, and here, in the UK, war is viewed as something that happens far away on foreign shores. It's awful. Soldiers lose their lives and their limbs in many horrific and painful ways, but for those of us not involved, war is something that is neatly contained away from our lives and safely ensconced within our TV, where we can tut and complain about which politician or leader is to blame. 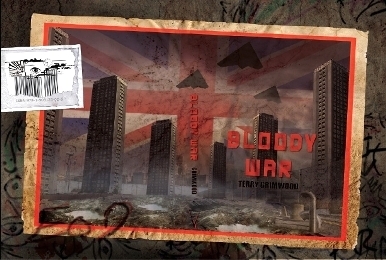 Except now, in Terry Grimwood's Bloody War, it's not on TV! 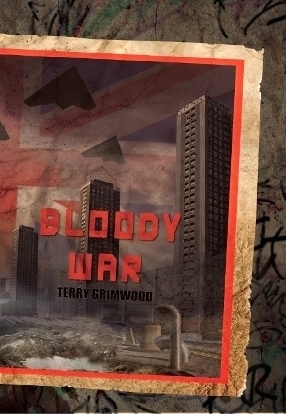 The horror and terror of a cataclysmic war has somehow come to the shores of Great Britain. Set in the present, horror, bullets and missiles scream down from above the city of London, where it is attacked by an initially unknown assailant, only darkly referred to as the EoD—the Enemies of Democracy. Our hero, Pete Allman—a family man, with wife and children—wakes up one day and discovers that something is not quite right with his world. Before—when was that exactly?—his world had been fine. Normal. Definitely no battle overhead, no tanks in the street, no curfews, no draughts, no ignoring of Veterans. But now? White crosses are taped over every window, blackout curtains hang over every pane of glass and though his job as an IT technician still remains, he discovers that his post has precluded him from being signed up to fight. IT technicians are needed to make sure the computers still run, because the computers control a lot of things that Pete doesn't need to know about. Until he downloads some illicit information onto a memory stick. What do all those names and numbers mean? Pete's confusion and fear are written with insightful realism and effect and you really feel for him as the protagonist because you can imagine yourself being put into the very same situation. How would you cope? How would you react? Would you follow the rules set down for you, blindly? Or buck against the system? Pete's on a ticking clock. His son is about to turn eighteen and when you hit that age in this story, there are no parties out on the town, just enlistment to fight. Pete doesn't want his son—or anyone else for that matter—to die. This story takes you on Pete's hair-raising quest to find to the truth of the matter. He wants to know why it happened: how one minute life is good—except for an appendicitis attack!—but the next, war has exploded in his country. Pete's character goes on a huge emotional journey in search of the discoveries. This fast-paced book has twists and turns, and the story pulls you this way and that. This is a thriller, written in a surprisingly conversational, intimate tone, allowing you as the reader to travel on Pete's journey with him. Grimwood's tale is gripping from the first page and definitely has that PTQ: Page Turning Quality. His character Pete is one you can easily relate to. In fact, Pete could be anyone....the man next to you in the shopping queue....or even you or me. If there has to be any criticism at all, it would be the typos in the book, but apart from that, this story is a great thriller and highly recommended, full of easily imaginable imagery and realistic, potential horror. You can buy Bloody War HERE. Blues singin’, harmonica blowin’, jam-nite perfomin’, tea drinkin’, college lecturin’, always-writin’ Terry Grimwood lives in England and has been published in a wide variety of magazines and anthologies, including Bare Bone, Nemonymous, Midnight Street, Darkness Rising, Peeping Tom, ParaSpheres and The FutureFire. He’s even slipped a romance into People’s Friend! Terry’s first collection, The Exaggerated Man and Other Stories (with an introduction by Gary McMahon) has been called “Brilliant modern horror” by The Horror Zine’s Jeani Rector. His second book, The Places Between, has been reviewed by The Horror Zine. 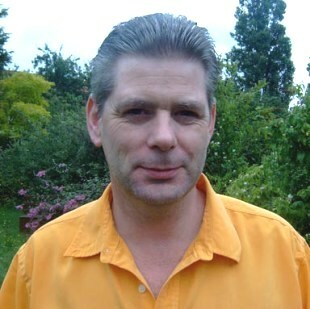 Terry also has a trio of plays under his belt, available to anyone who is interested in performing them: just let him know via his email address below. In fact, if you love writing and reading and all things books, he’d love to hear from even if you don’t perform in plays! Terry is married to the transatlantic poet, Jessica Lawrence, and her collection Dreams of Flight is available from The Poet Launderette Press. Oh, and Terry’s own Exaggerated Press has recently published the not-to-be missed John Travis’ collection, Mostly Monochrome Stories. The Exaggerated Man and Other Stories is available HERE. 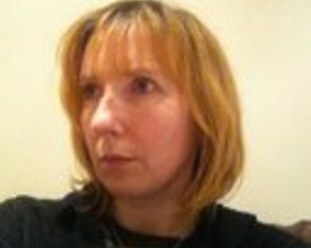 Nicolette Heaton-Harris writes as Nick Harris and is the author of Old Lady (The Horror Zine), Circle (Gypsy Shadow Publishing) and Rest In Peace (Welcome to Wherever). She has written six non-fiction health titles and one mystery suspense novella for Aspen Mountain Press under the name Emma Pearce. You can visit Nicolette Heaton-Harris HERE.